If you have broken your Android smartphone soft keys or buttons or damaged the flex cable on your smartphone, don't panic there is always a solution here on GuruHT, don't waist more money on changing the case or buttons or even you must change the whole screen. 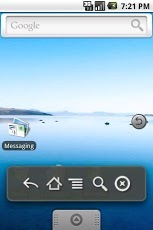 The solution is by using a simple free application that will display all your regular buttons such as menu, search, back button and home button on the bottom of your touch screen, always on top of all running applications permanently. All you have to do is to root your Android smartphone (if your smartphone is not rooted leave a comment bellow and I'll help you), then just install an application named "SoftKeys for ROOT USERS" you can get it over here or search for it on Google Play, then run and configure the soft keys as your device physical soft keys. Wish this help you guys.